Many parents of a teenager or young adult feel as though they're guessing about what to do next--with mixed results. We want to stay connected with our maturing child, but we're not sure how. And deep down, we fear our child doesn't want or need us. 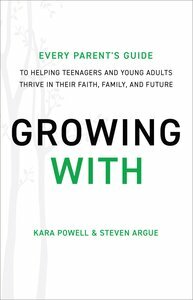 For any parent who longs for their kids to keep their roots even as they spread their wings, Growing With offers practical help and hope for the days--and years--ahead. Steven Argue is associate professor of youth, family, and culture at Fuller Theological Seminary and applied research strategist at the Fuller Youth Institute. He also serves on the board for the Association of Youth Ministry Educators. Steve researches, speaks, and writes regularly on topics surrounding adolescence, emerging adulthood, faith, and spiritual struggle. He and his wife, Jen, love being the parents of three emerging adult daughters.